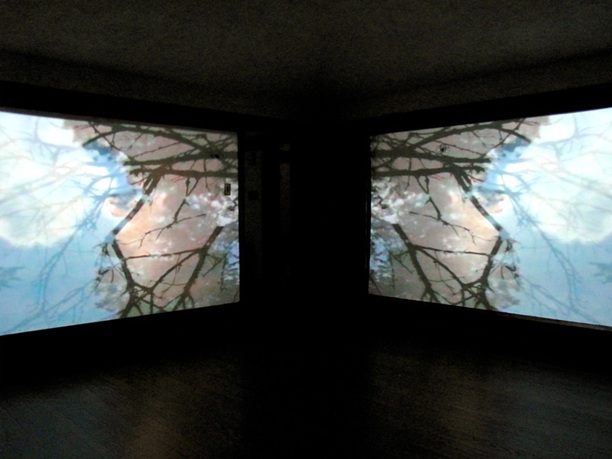 View of Projecting Modern, 2010, Robie House, Chicago. Photo: Brian Reis. 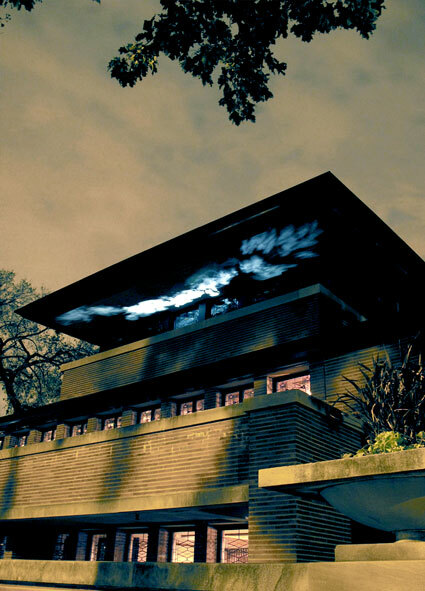 Projecting Modern is a commissioned video installation that uses both the exterior and interior spaces of Frank Lloyd Wright's iconic Frederick C. Robie House as a canvas on to which to project the idea of "modern" and what that means for artists and audiences today. Through their work, artists Petra Bachmaier and Sean Gallero, of the collective Luftwerk, change visitor perceptions of the space and encourage re-visioning of Wright's integration of pattern and nature in his architectural designs. Free and open to the public from 6:00 PM to 10:00 PM on October 23, 2011, the installation provokes visitors to explore seemingly disparate video projections that, taken as a whole, provided one integrated exhibition of light and multimedia images that spoke to, rather than spoke for or about, Wright's aesthetic. 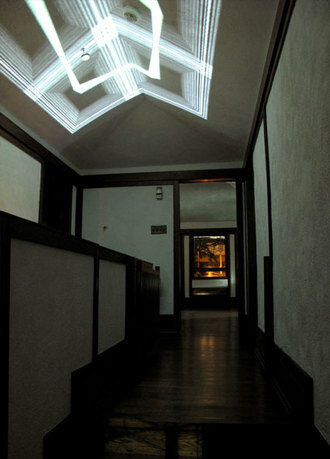 Luftwerk is an artistic collaborative of Petra Bachmaier and Sean Gallero. 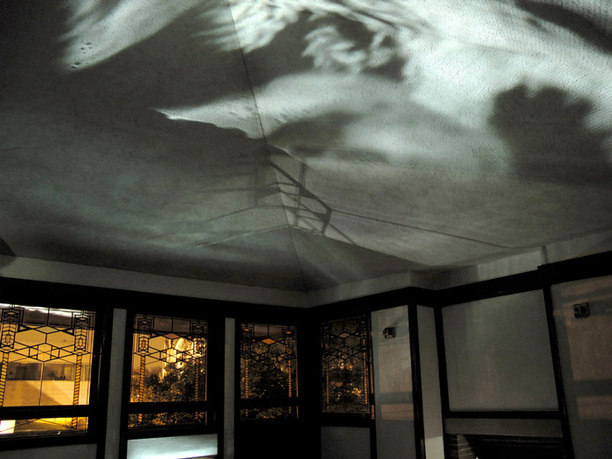 Together, they explore and create projection designs and experiences. 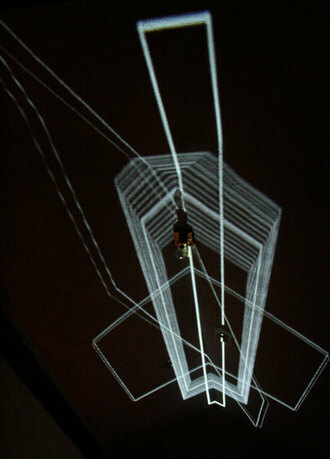 Their work transforms environments and shapes lumens of video projection into a moving and spatial form. Vignettes of images interplay with sculptural materials to illuminate a realm that lies beneath a surface. Bachmaier earned a BFA from the School of the Art Institute of Chicago and an MFA from the Hamburg Academy of Arts, where she graduated with special honors in 2000. Sean Gallero received a BFA from The School of the Art Institute of Chicago in 1999. 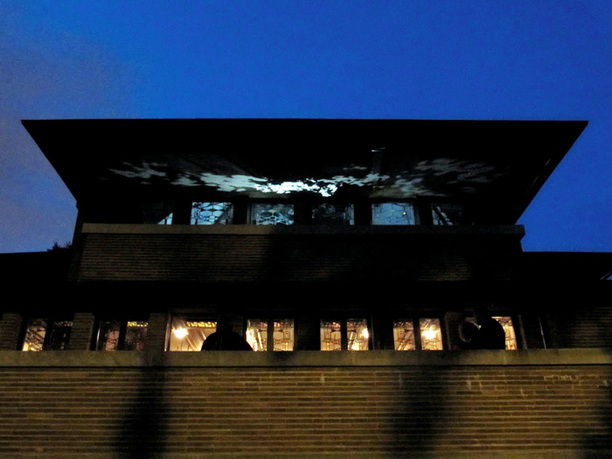 Projecting Modern was the brainchild of Brian Reis, formerly assistant curator of the Frank Lloyd Wright Preservation Trust. 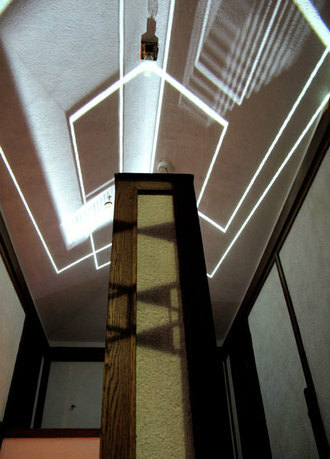 As Projecting Modern's lead curator, he worked personally with Luftwerk to ensure artistic integrity and alignment with the goals of the Preservation Trust as well as the spirit of the Robie House. 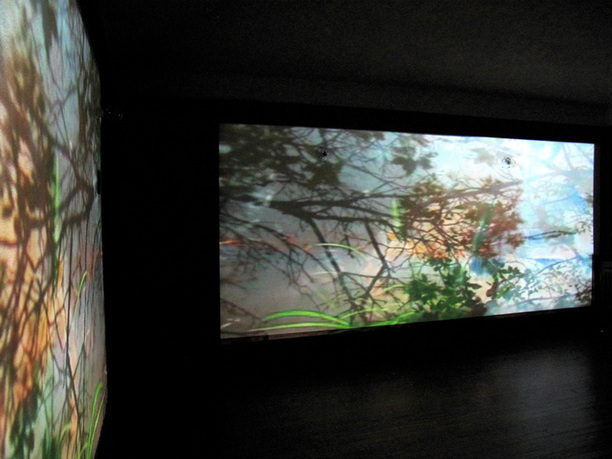 Reis has organized intuitive and ephemeral contemporary art exhibits as well as permanent museum exhibitions. He has ten years of experience in the museum field and is also an exhibiting artist of personal work that investigates architectural spaces and reflects upon their meanings as revealed through time and the collective stories of our surroundings. He holds a BA in fine art photography from Columbia College Chicago and an MA from Northern Illinois University in art history, along with a certificate in museum studies. Reis is currently executive director of the Ellwood House Museum in DeKalb, Illinois. The Frank Lloyd Wright Preservation Trust (FLWPT) was established in 1974 as the Frank Lloyd Wright Home & Studio Foundation to acquire and preserve Wright's Home and Studio in Oak Park, IL. The $3+ million restoration was completed in 1987. In 1997, the Home & Studio Foundation also assumed responsibility for the management and restoration of Wright's Robie House in Chicago, IL. In 2000, the Home & Studio Foundation changed its name to the FLWPT to better reflect its dual stewardship of the Home & Studio and Robie House. 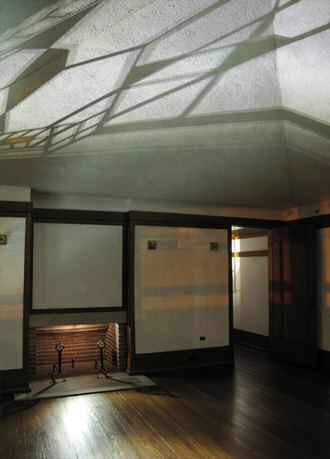 The FLWPT is solely responsible for the Robie House restoration, which progresses as funds are raised. 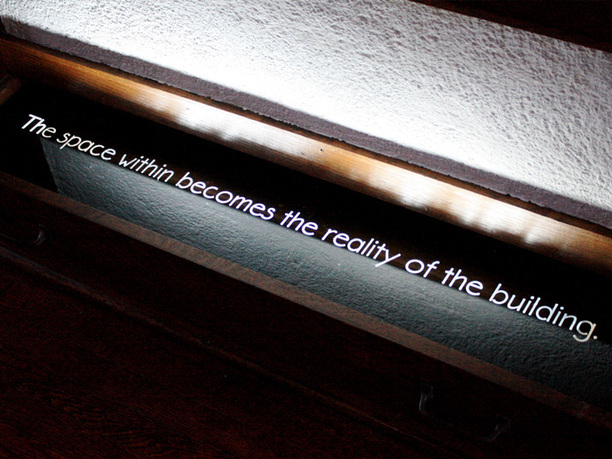 The FLWPT's mission is to engage the public in educational and aesthetic experiences to foster an appreciation of architecture, design, and the legacy of Frank Lloyd Wright.